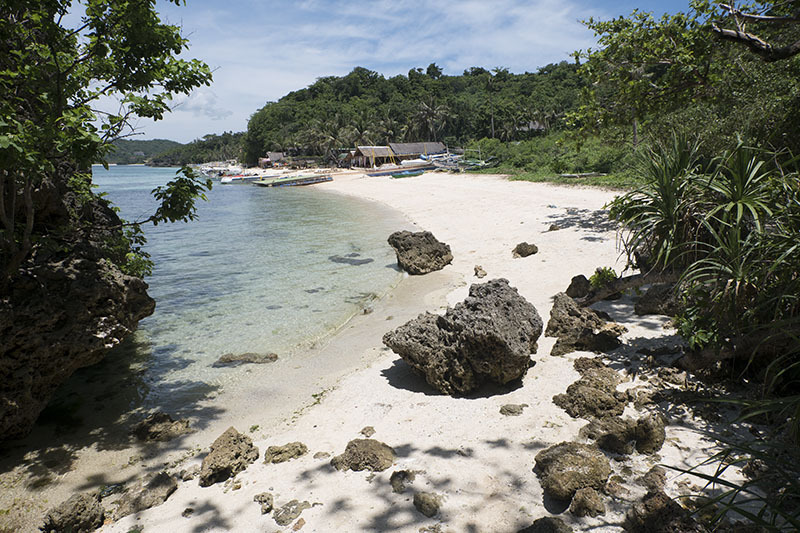 The streets and sprawling shoreline of Boracay buzz with life. At around 12 o’clock last night, on our way back to our lodging, gusting winds and heavy rain slapped us. The beach was nearly deserted. So the picture below was totally different from the island’s sour mood last night. My first time in Boracay was just splendid! Thank you, Mother Nature, for the amazing weather. Our flight was delayed, as with most afternoon flights. I’ve been told to fly in the morning to avoid flight delays (yes, this travel tip really works). But I didn’t really have a choice. Air You Go Travels arranged our trip in a neat package. Among the drawbacks of booking a tour through the agency were (1) you can’t choose your flight schedule and (2) you can’t pick where to stay. They put us in Wald’s Place. Though it’s a non beachfront property (beside La Carmela), the place is only a few steps away from the beach. The check-in area was a little hard to find as there were other B & B and inns within the compound. Wald’s offers rooms that cater to couples, families and even groups of four or more. While I like the location, I didn’t enjoy walking on its flooded grounds when rain poured. Of course, there are also advantages of booking through Air You Go. If there are at least four people in your group, each of you only need to pay P2,988 per person for three days and two nights of stay (including airfare). It doesn’t cost so much to visit one of the best islands in the world, after all. 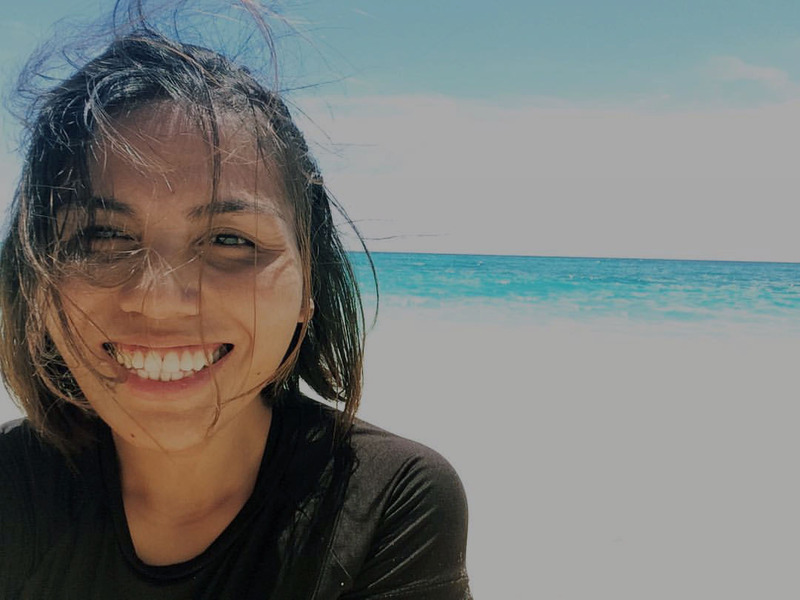 I lost my job three months before our trip to Boracay. Luckily, I had Neil and a freelance writing gig to keep me afloat. But a trip to Boracay does not make sense if you’re not in your best financial shape, does it? Well, it does, if you have friends who would travel at all cost. 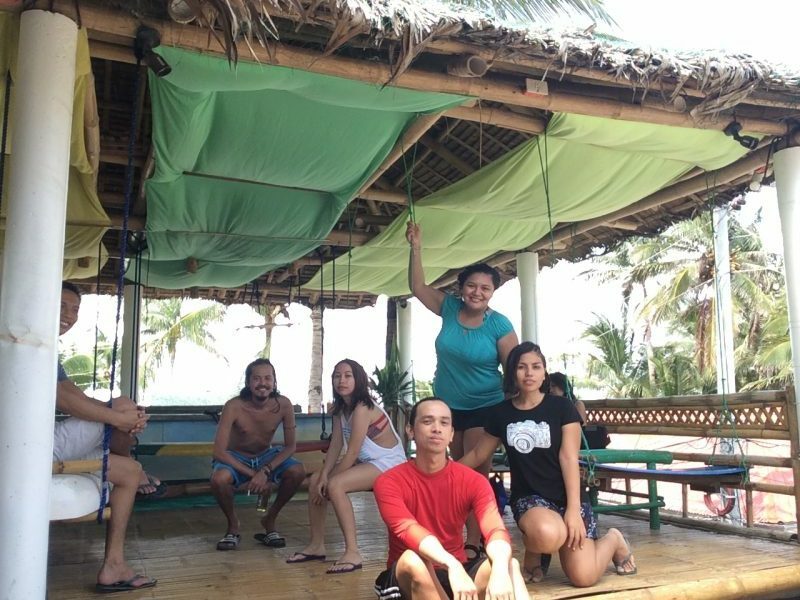 Long story short: I booked a cheap trip to Boracay with friends from OB, a defunct digital marketing agency in Cebu. As expected, Jewel, Cybil (plus best friend, Jen), and Rob were in. As for Neil, he was my non-negotiable plus one. As soon as flights and lodging had been sorted out, we only had to worry about tours and food. You’ll save a ton if you don’t like to drink or dance until dawn (with your feet in the sand). If you come to Boracay to discover its idyllic parts (skipping the rowdy parties), you don’t have to spend so much money. 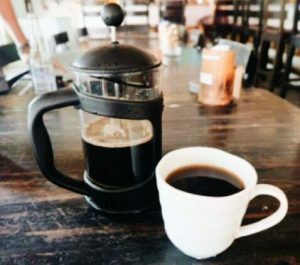 One of the compelling reasons we chose Boracay over other island destinations was Drix. 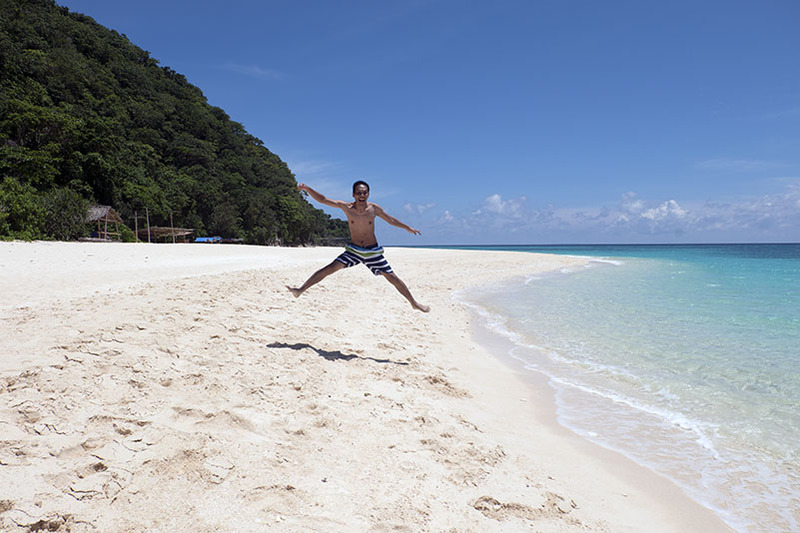 Our friend was posting stunning images of Boracay, luring sensitive souls like ours to visit. The legend was living the dream, managing the operations in Jeepney Hostel and Kite Resort in Boracay. He goes to work shirtless and shoeless, with free access to beautiful sunsets, thrilling nightlife, and soothing sea breeze. After strolling by the long stretch of White Beach, navigating the busy D’Mall, and riding a tricycle, we finally found Drix’s workplace. He then escorted us to their unique lounge and there, we found the most comfy-looking surfboards and hammocks. I’ve never seen an Open Mall in my life and one that’s located in an island for that matter. I’ve been to Bantayan Island, Camotes Island, El Nido, Bohol, and Camiguin, but none of them had an open mall like D’Mall in Boracay. It was big and busy. Here you’ll find familiar restaurants and a motley of souvenir shops. As we were heading back to station 2 to take a nap, Rob was feeling hungry. We decided to stop by Mang Inasal so he could eat his favorite Skewered and grilled chicken while Neil and I shared a huge serving of their halo-halo. Earlier that day, we stumbled upon Subway while searching for breakfast. Do you know that you can’t find a Subway in Cebu? And Boracay has it? I guess Boracay won my heart for its wide array of restaurants and coffee shops. If you’re impressed by the long, gorgeous stretch of sand at the White Beach, wait until you see Ilig Iligan and Puka Beach. 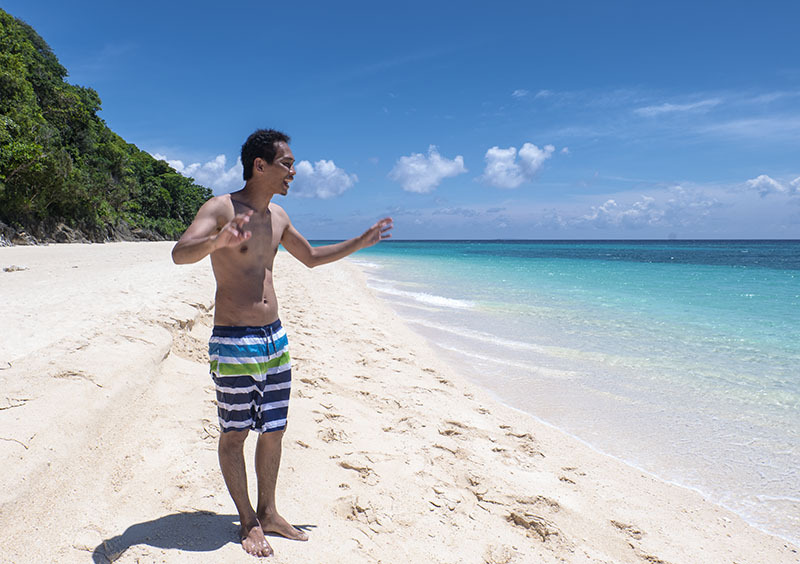 Unlike the crowded beach in mainland Boracay, these public beaches offer serene, crystal clear blue-green waters and the brightest sunshine I’ve ever seen since we arrived. Then, without realizing it, I started using my cellphone as a camera and less so as a way to check emails or Slack messages. It was a new 5S iPhone I decided to get after years of contemplation. When I scroll the photos on my phone now, I catch myself browsing images of my past adventures, plenty of them were photos taken in Boracay. Going to Puka Beach and having the whole place to ourselves was surreal. No photobombers. Everywhere I point my phone camera, it seemed like we were the only tourists in the island. At that moment, I truly felt that we had made the right decision to choose Boracay. Will I Come Back to Boracay? For the first time, Neil and I didn’t see eye to eye about a place. He didn’t want to return to Boracay but I still wanted to go back. I guess we missed Boracay’s unique selling point as a tourist spot. Can we say we’ve truly seen Boracay sans the crazy parties? If that’s what you came here for, hop on to Jewel’s blog for an account of LaBoracay celebration back in 2015. I don’t like getting wasted but isn’t fun to see others get drunk and “lose it”? As for the views, Boracay has to work on preserving its beauty. Drainage management is a problem especially in Station 2’s biggest resorts. If it’s possible to travel back in time when Boracay wasn’t as well-developed (or abused) as it is now, I would want to see what the White Beach was like. Despite everything I’ve said, I might still visit Boracay. After all, I haven’t done any of the water activities everyone was telling me about. They must be super fun. Just so you know, I left the island with this big grin on my face. Hi Mam, how was your trip with Air you go travels? Hi Paula! It was okay. Everything went according to plan. 🙂 Next time, we’ll choose a more expensive package so we can get a better room.